Sydney Marshall, the son of Herbert & Hannah Marshall, was born in Luddenden, Yorkshire on 30 May 1896. He had two brothers and three sisters and in 1901 they were living at the ‘Lord Nelson’ Inn, High Street, Luddenham. In 1911 he was an apprentice plumber living in Eaglescliffe, Preston-upon-Tees. He was a fitter’s mate living in Outram Street, Stockton-on-Tees. when he joined the 18th (The Pals) Battalion Durham Light Infantry on 10th April 1916 in London. He landed in France on 2nd July 1916 and was promoted Acting Lance Corporal on 15th May. He reverted to Private when he was transferred to the 1st/6th West Yorkshire Regiment on 13th July and was wounded ten days later. On 24th July he was repatriated to England. He returned to France on 2nd January 1917 with the 15th DLI but returned to the 18th Battalion the following day. 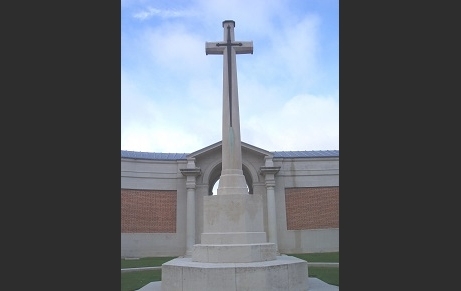 He was killed at the Battle of Arras on 18 May 1917 and is commemorated on the Arras and Eaglescliffe 1914-1918 Memorials and in the DLI Book of Remembrance in Durham Cathedral.